Rumors and speculation ultimately ended in two deals between three teams as the National Lacrosse League trade deadline came and went Monday at 3pm. Rochester’s young roster and slew of upcoming draft picks made them potential sellers especially if they had lost to Buffalo this past weekend. Well, it turned out that they were victorious and kept in the thick of the playoff race in the East. The Knighthawks stood pat and it was the West Division that added a couple of impact players. 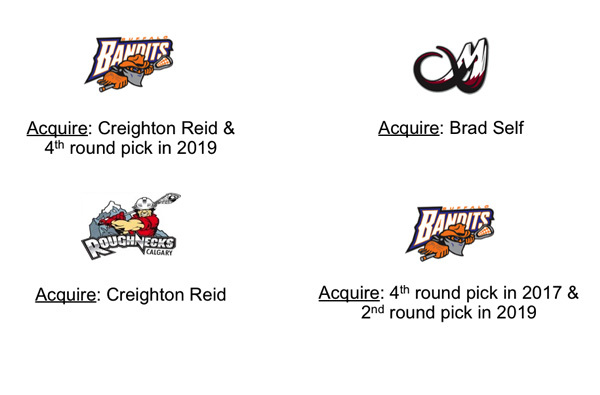 Calgary and Colorado both acquired veterans, while the Bandits collected capital for upcoming drafts. What do these moves mean for the clubs involved as well as the overall post-season picture? Only four weeks remain until the battle for the Champion’s Cup begins.